A mission statement helps an organization to define its purpose in the now and communicate it to its stakeholders. That is why a good mission statement has to be concise, clear and able to articulate what’s unique about an organization. Do you need to have a mission statement? Business isn’t done for the sake of it. Of course, making money is a crucial element of making business, but an organization also exists to create a culture and push its core values and beliefs into the world. Therefore, a company’s purpose is as important if not more of how it decides to make money. Therefore a mission statement is a great way to define a brand purpose and communicate it outside the organization although the brand purpose and mission statement is not the same thing. In the 2018 Deloitte Millennial Survey Report, it shows that millennials (people born from 1981 and become adult at the turn of the 21st century) in particular have lost faith in business. Therefore, a company purpose can help the organization better alight with its customers, and employees, but also with its other main stakeholders (owners, and suppliers). As the mission statement helps define and communicate the goals of the organization, it also helps align its interests with those of employees and customers. While a larger an organization the more it might need a mission statement. A mission statement can help startups and small organizations create a strong identity. Like the moon mission, a trueBHAGis clear and compelling and serves as a unifying focal point of effort– often creating immense team spirit. It has a clear finish line, so the organization can know when it has achieved the goal; people like to shoot for finish lines. ABHAGengages people– it reaches out and grabs them in the gut. It is tangible, energizing, highly focused. People “get it” right away; it takes little or no explanation. Thus a well-drafted vision reflects a long-term – seemingly unachievable – goal. At Google, they call it Moonshot Thinking. As it is so far into the future, it might also be easier to draft. A mission statement instead has to be specific, actionable and easy to understand to anyone within the organization, and from the outside world! It is a way to set the stage for action in the present moment. The objective of a well-crafted mission statement is to set goals that need to be achieved in the short and medium term. Those goals need to be communicated clearly to the key stakeholders. That’s why a good mission statement is clear, concise and able to communicate the uniqueness of the organization in the market place. Drafting a good mission statement isn’t a simple exercise as you need to go deep and define your purpose. You need to ask questions like: what do we do? Why do we do it? How do we do it differently? Whom do we do it for? And what key values do we bring that others don’t? Thefeore, from a well-drafted mission statement key objectives, can be derived. You can use several frameworks to draft a mission statement’s objectives. For the sake of this discussion, we’ll use the S.M.A.R.T. method. A characteristic of management excellence is a climate in which company officers and managers talk in terms of objectives. Quantitative support and expression to management’s beliefs. He recognized that objectives enabled organizations to “focus on problems, and give the company a sense of direction.” Yet he also recognized executives couldn’t define meaningful objectives. Achievable – specify who will do it. Back in the 1970s, Intel was among the most respected and admired companies in Silicon Valley. During that time Intel’s CEO, Andy Grove, was the man who managed to drive organizational change. Andy Grove did that via a goal setting process called OKRs or objectives and key results. Where the objective is the direction, toward which the organization needs to be in the medium term. And the key results are milestones, things that allow the company to get there. Those key results needed to be easily trackable, understandable and shared across the company. In other words, while you define a key and actionable objective. 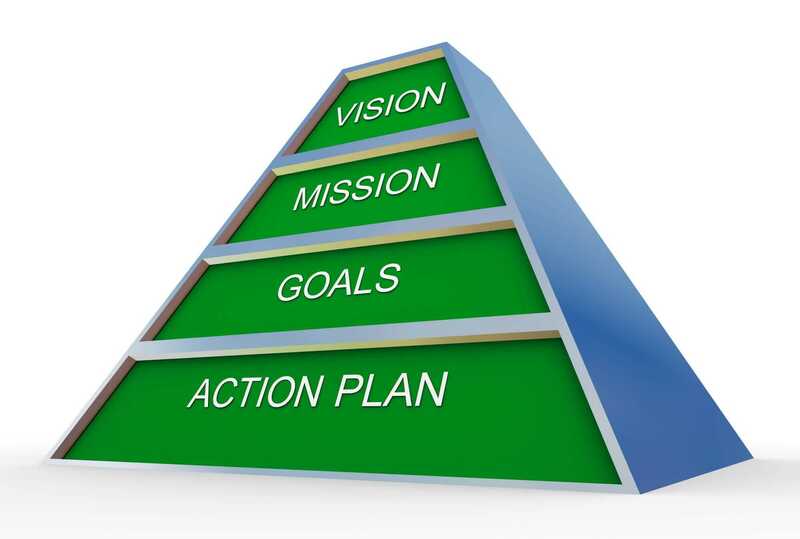 This objective is what in the now will get you going to get you closer to achieve the vision set 10 ahead from now. Therefore, it is important to ask what actions you’re doing today will bring you closer to your vision. You also need to make it achievable. Indeed, most people think that to make people act you have to set reasonable goals. That isn’t always the case. Indeed, the so-called 10X goal setting might make your organization more successful than a regular goal setting schedule. However, we’ll leave the big hairy audacious goal to the vision statement. While, we’ll let the mission statement be more realistic, as it needs to set things in motion. In other words, where a vision statement has to be inspirational, a mission statement has to be motivational. In terms of structure, an opener like “Our mission is to…” followed by an adverb or a verb that makes it actionable “build the …” an adjective and noun that indicate the uniqueness of that mission “leading product…” and a closer that defines its uniqueness might work pretty well. Of course, this is one example; let’s look at some of the mission statements out there. Let’s analyze some of the mission statements of companies that influence our daily lives. It is important to remark that in no way I’m trying to say that a mission statement correlates with a company’s success. A mission statement is a tool that well drafted can serve as a way to focus on the actions of groups of people within the organization. It also helps in creating an identity and culture within the organization. Whether or not that determines the success of a company it’s not possible to determine, in my opinion. Indeed, we’ll see how very successful companies set out mission statements that on paper might see entirely off, and we’ll start from Google mission statement. Google‘s mission statement doesn’t sound too far from a vision statement. Indeed, Google is the leading source of the world’s information. However, this same mission was set out by Google’s founders back in the days when Google was still a small startup. I think at the time when people did read this mission they thought of it as too ambitious for a company that at the time was not a key player in the search industry. Yet this is at the core of Google‘s Moonshot Thinking. And this mission helped for sure the company to focus on a key long term objective, that they indeed achieved! I’m sure out there is plenty of organizations, now dead, that had very ambitious goals. However, I do think that a very ambitious goal is part of a good mission statement. Microsoft mission statement is also very generic (every person and every organization on the planet) and it didn’t set a specific goal (achieve more of what?). I don’t think that is a good example. It is not time-constrained as this is an ongoing objective. As we can see from the examples above, drafting a good mission statement isn’t a simple task. And as a mission statement becomes universal, it also risks to lose its specificity and become too generic with no utility. I believe that a good mission statement should in the first place allow an organization to align a group of people with focusing on the same objective while getting them inspired. Of course, a mission statement has to be accompanied by specific plans, and it needs to be executed daily to become effective over time! However, from the mission statement, a set of core values can be derived. Those core values will be the guiding principles of the organization.